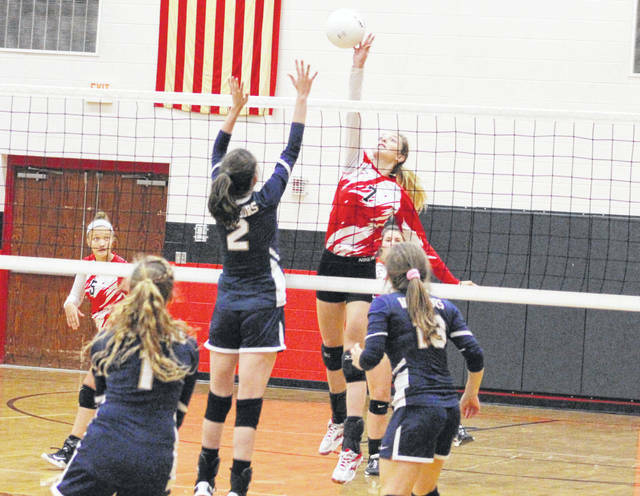 Wahama sophomore Emma Gibbs (7) hits a spike attempt during an Oct. 16 volleyball contest against Cross Lanes Christian at Point Pleasant High School in Point Pleasant, W.Va.
Wahama had two players chosen to the 2018 West Virginia Sports Writers Association Class A all-state volleyball teams for the 2018 season. The Lady Falcons (6-19) were represented by senior Hannah Billups and sophomore Emma Gibbs as special honorable mention selections. Both Billups and Gibbs are first-time all-state honorees in volleyball. Billups recorded 19 aces and had an 88.7 service percentage to go along with 48 kills and 126 digs. Gibbs recorded 11 aces and had a 94.1 service percentage to go along with 70 kills, 25 blocks and 99 digs. Kyndra Pilant of Magnolia was chosen as the first team captain, while Courtney Sanford of Doddridge County was the second team captain. Kyndra Pilant, Magnolia (CAPTAIN); Josey Jones, Tyler Consolidated; Mady Winters, Magnolia; JoLee Walton, Tyler Consolidated; Bethany Arnold, Williamstown; Kylie Stephens, Wirt County; Sarah Jude, Tolsia; Abi Haught, Ritchie County; Gracie Lowers, Parkersburg Catholic; Julie Ignatiadis, Huntington St. Joe. Courtney Sanford, Doddridge County (CAPTAIN); Amanda Church, Greenbrier West; Rachel Rosen, Trinity; Kendall Bowen, Ravenswood; Jenna Boice, Parkersburg Catholic; Kayla Bauman, Williamstown; Courtney Green, Greater Beckley Christian; Emma Wyer, Wirt County; Lindsay Chapman, Gilmer County; Hope Weber, Paden City. Kayna Anderson, Magnolia; Lindsey Rinker, Moorefield; Aaliyah Brunny, Parkersburg Catholic; Nevaeh Dickens, Greater Beckley Christian; Kenley Posten, Greenbrier West; Dejah Busby, Sherman; Hannah Heatherington, Ravenswood; Elizabeth Kay, Charleston Catholic; Brooklyn Hinzman, Doddridge County; Elizabeth Conley, Valley (Wetzel); Janessa Harris, Buffalo; Lakyn Joy, Williamstown; MaKenzie Judy, Meadow Bridge; Hannah Billups, Wahama; Morgan Mullens, Trinity; Hailey Carreon, Clay-Battelle; Andrea Alimario, Madonna; Jessica Smith, East Hardy; Mallory Yeater, Paden City; Emma Gibbs, Wahama; Brooke Slaubaugh, Buffalo. Rebekah Markwood, Moorefield; Cassidy Roles, Fayetteville; Alexa Johnson, Tyler Consolidated; Jenna Fisher, Greater Beckley Christian; Gracie Graham, Williamstown; Kenzie O’Dell, Greenbrier West; Brianna Jones, Ritchie County; Bailee Yokum, Notre Dame; Kasey Hoff, Ravenswood; Gavin Pivont, Summers County; Lainie Ross, Parkersburg Catholic; Erika Turner, Huntington St. Joe; Erika Newell, Calhoun County; Ashlynn Coffman, Greater Beckley Christian; Lacie Bills, St. Marys; MaKenzie Arbaugh, Pendleton County; Jasmine Ball, Doddridge County; Aden Watts, Tolsia; Katherine Henderson, Hundred; Kylie Saltis, South Harrison; Amy Frosch, Notre Dame; Leneica Grimm, Magnolia; Sierra Marie Miller, East Hardy.